As a recent AFOL who is also on a budget I've discovered that TJ Maxx carries discontinued Lego sets at 30-50% off retail. They don't have a lot of stock or even variety. I've only found a few Atlantis and Prince of Persia sets. For people who have been buying Legos for awhile, how often does TJ Maxx rotate inventory or get in new sets? I'm basically wanting to know how often to go by there to look for new sets. 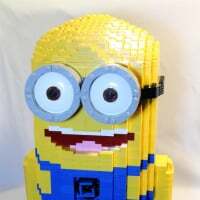 If they only re-stock their Lego sets a couple of times of the year then I won't bother, but if they get new inventory on a monthly basis then I will be checking by. I am no expert, but my understanding is that many TJ Maxx stores get the stuff that doesn't sell during Target's clearance sales. I believe Target does a big clearance after Christmas and then one during the summer. There could be more. The lego at my Target never get below 50%, so the assumption is that these items then go to TJ Maxx. I personally don't go out of my way to go to TJ Maxx because it is so hit or miss. Although there is a TJ Maxx right next to my local Target. But that one never seems to have Lego. I visited two TJ MAXX stores recently, both had a few Prince of Persia sets. In general they were only in the 30% off range so I didn't pull the trigger. I visit TJ Maxx just every once in a while, as it doesn't seem their stock changes that frequently (at least at my local store). They recently had the Kingdoms MVR for $59. A few weeks back I could have bought PoP Battle of Alamut for $44. It was hard to get excited about that because last year at Walmart, they clearanced all their Alamut sets for $29 and $39. Same thing with sets like the Kingdoms King Chariot. TJ was marked down to $29.99. I had just bought a few from Target.com when they had a half price sale for $19.99. So it wasn't that great. This was, of course, before the huge clearance at Walmart. So there are some good deals but they aren't overly great. We found a beat up Pirates Brickmaster book set a few months back. It had all the pieces but the outside book was a little banged up. They marked it down to $5 for us. My son was very excited. I've never even been in a TJ Maxx store, and I won't bother for Atlantis and PoP. MVR is the only set that it would be worth going to TJMaxx or Marshalls for, as it is a set with great pieces and it had a very limited life span. The Kingdoms sets seem to have been sent away due to their abrupt cancellation, not the lack of sales as these sets have been selling well, and so the MVR has a lot of potential in the future for value gain. The various Atlantis/PoP and even King's Carriage are not nearly as exciting sets. I've only been to TJ Maxx and Marshall's this year. I hadn't really paid attention to PoP when it was first out, but who can resist ostriches and camels? So I have four of the PoP sets from TJ Maxx ranging from 33-80% off RRP. I've also seen Atlantis, Kingdoms, Toy Story, Racers and Cars there. There haven't been any new arrivals since I first went at the beginning of the year but they had Atlantis while Target was still carrying it so I don't think that's their only source of LEGO. I check a few every so often because 80% off is a good deal on pretty much any LEGO, I can always use the parts. I was actually on the look out for the Kingdom MVR as I had read that they were being carried by TJ Maxx. I purchased the Atlantis Squid set as it looked pretty cool and same goes for the POP set as it has a light up brick and a lot of gray pieces for future castle building. 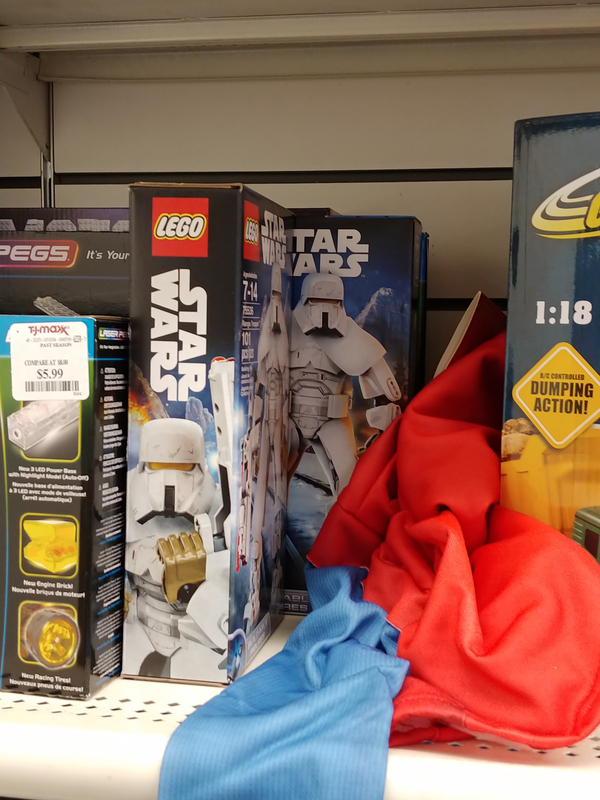 Our local TJ Maxx and Marshalls stores don't generally get a lot of LEGO inventory in. I did pick up an MVR for $49 earlier in the month and I found a Hero Factory Drop Ship for $29.00 as well which was a surprise (but a nice one - my son loves HF). I never really go to look for LEGO at either store, though. I did pick up an MVR for $49 earlier in the month. That's the set and deal I was looking for. What state or city do you live in? I'm wondering if certain regions get certain sets over others. In my experience, the deals for TJ Maxx occur when the item is beyond more than 1 clearance season. 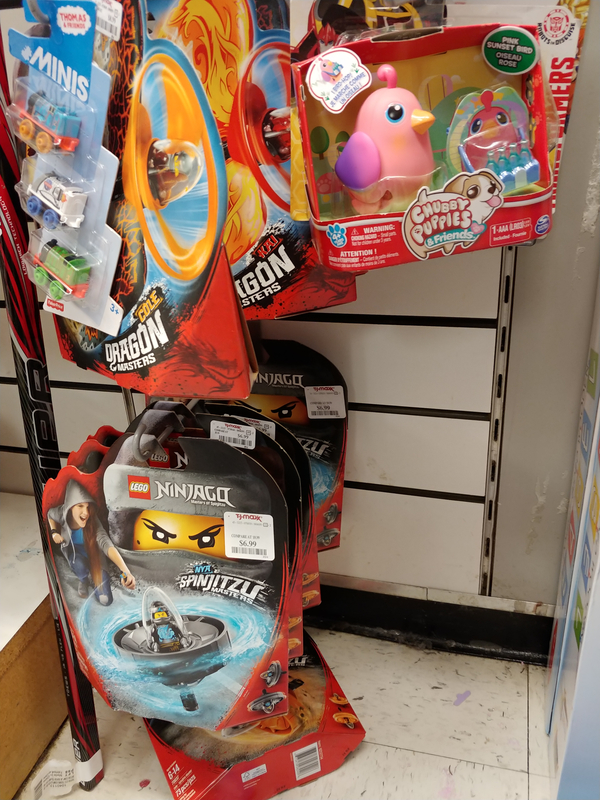 At my local store, which is pretty remote, I've found some PoP stuff that is greater than 50% off, but it's been through 3 reductions (I can see the different stickers) and the last sticker says "Final Clearance - Past Season". I've only been visiting TJ Maxx for LEGO for a few months, but I've been trying to let the product linger for the price to keep going down. That's worked for PoP, but did not work for MVR. I saw 3 of them for $49 and decided to wait since I had some of them from Walmart at $35. Those were gone the next week when I stopped by. 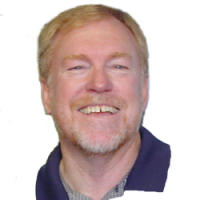 ^^@mathew, I live on the North Shore of Chicago. That was the only Kingdoms set in the store and there was only 1 (there were several PoP sets) - I checked a couple other stores and didn't find any more. It might be a timing issue. I gather these sets were brought in before Christmas, but I never bothered to check at that time. Most of the PoP stuff I found was marked as "Final Clearance"... and probably the only reason I purchased them. Not a bad deal though! Still one lone MVR sitting on the shelf and they wouldn't go down any further from the $50 price point. I have only seen PoP and Atlantis sets. Back in early 2008, I found a Nocturn for about $7 at a TJ Maxx. I thought it was a super deal for a set that I thought had vanished from shelves in the fall of the previous year. for those near TJMaxx and Marshalls, keep checking. I just found MVR for $39. If you don't have any at $50, I doubt they'll get any in. If they do, it may have taken the "next step" in the markdown journey. ^ Same here. The two stores closest to me had a few alien and PoP things a few weeks ago but are brick free now. Has anybody seen the Atlantis Turbo Sub for less than $15 at TJMaxx? ^ no, I'm waiting too. Not yet, but in my area there's a lot of them on the shelves. I find it to be a pretty ugly vehicle so it would take a good deal for me to buy it. The Turbo Sub went to $10 at the Marshalls by me this week. Just a heads up that I was in two separate TJ Maxx's this week and was watching the employees doing new clearance mark downs. I think they do this monthly, so if you noticed something on the shelves in Feb. and passed, it might be time to check again. Definitely hit or miss as some stores I went to (TJX, Marshalls and Home Goods) had zero Lego. BTW, didn't find any Lego in any Home Goods, so I'm assuming they just stocked toys during the holiday season and all have been cleared out by now. Got PoP Quest Against Time for $22. Ostrich Race (yes, couldn't help myself) for $7. Atlantis Gateway of the Squid for $15, and several Magikus games for $3.50 each. Saw a few Turbo Subs for $11 but passed. Also saw some Lego Pirates game (the bigger Lego type that was made for 4 year olds several years back) by RoseArt. 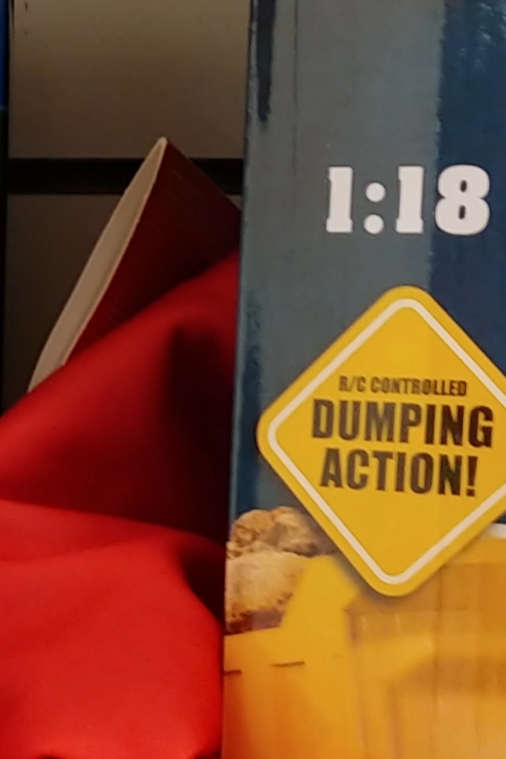 Wonder how long that has been sitting on the shelf? Bought PoP Ostrich race sets and then had buyers remorse (I've spent nearly a mortgage payment on LEGO this month) and returned these sets. I also hoped that they would go down in price once returned. I went back about a week or 2 later and they were gone. I don't know if I am more upset over missing out on adding a few more Ostriches to my stable of LEGO animals or if I'm bugged that I don't know if the price was lowered and I missed out on a really good buy. 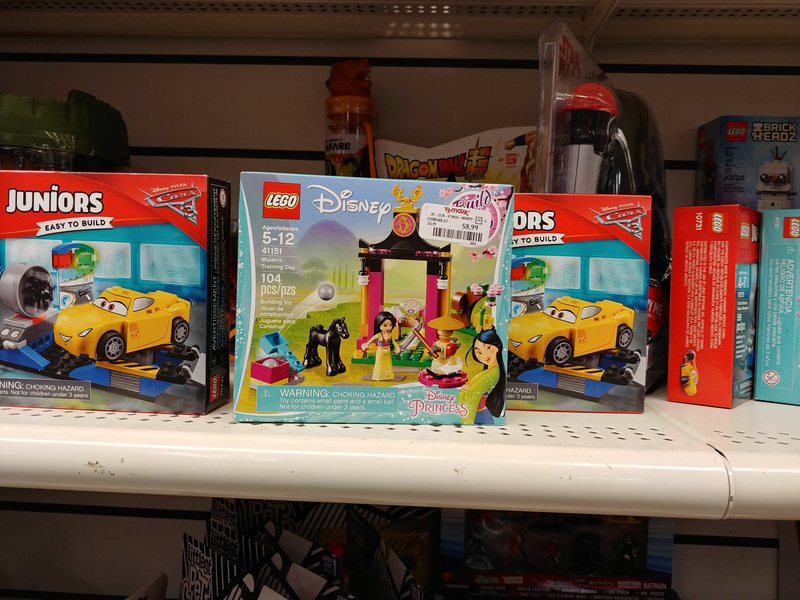 Anyway, those that advise waiting for the next round of markdowns to take place before buying these LEGO sets at TJ Maxx run the risk of the sets selling out! I've had great luck at my local TJ Maxx. I picked up a few Atlantis sets for 40% off, a ton of World Racers at 40-60% off and some Duplos for my youngest at about 30% off. All they've got left is Prince of Persia, which I'm considering picking up just for collecting's sake. They are pretty cheap. ^ I dunno about PoP, I just do not see that endearing of a PoP LEGO fan that would want these later on... They are good for parts though. 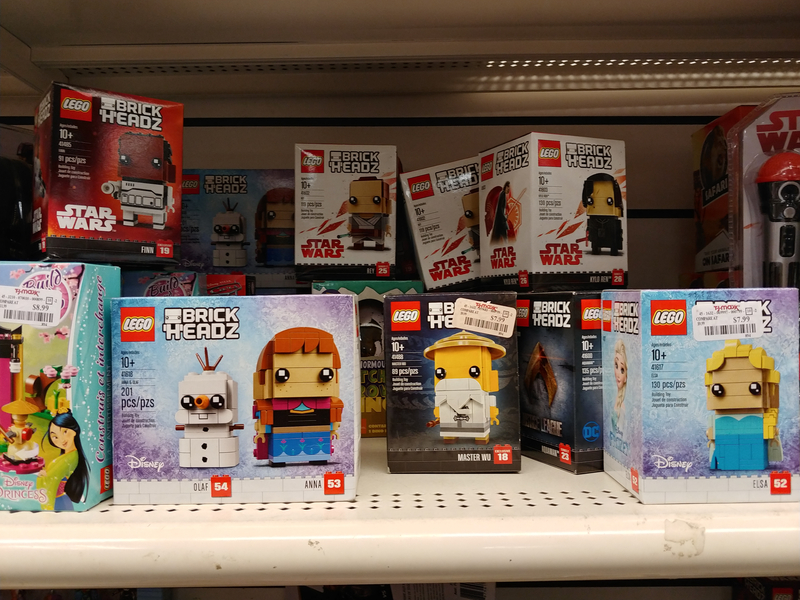 Has anyone in southern California found legos at TJ Maxx? I've gone to a couple and found none. ^ Yes, seen them at TJ's and Marshalls. Not at the lower prices mentioned here, however. I didn't even know Marshalls sold Legos (or what they sold, having never been in one) but I checked out my local and found a few 7188 for $15, and two 8060 turbo subs one for $11 and one for $15. TJ Maxx had 5867 for $15 and the brickmaster books for $20. And thanks for the thread/info, so I have somewhere else to check occasionally for some decent deals. No LEGO sets at my nearest Tj Maxx. But I found a lone Pharaohs Quest set at Ross. You guys are lucky finding the Kingdom sets. 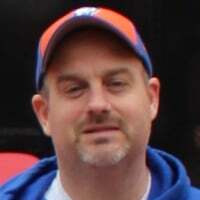 I looked high and low for Mill Village Raid to no avail. In my area, the only sets that the TJ Maxx and Marshall's have are Atlantis and Prince of Persia and they seem to priced higher too. I finally found a single Lego set at a TJ Maxx in Whittier, CA today- 7572 Quest Against Time. $29- not a stellar deal, but since it's a set I was eying I went for it. I'm still hoping to find the ostriches, and I'd love to find any Kingdom sets. ^ I've seen that PoP set a lot -- and Ostriches. The Kingdom's carriage set should still be found. Long time bump! Found some unexpected items today. What the? Didn't even think of TJ Maxx on my hunting list. Thanks for the necrobump. Checked one near me yesterday. No Lego at all except for a sticker book. These stores are definitely YMMV type of situations. Found a few interesting things tonight. Brickheadz (sadly no Luh-Loyd, though the Frozen ones are pretty darn new) a Buildable figure, Ninjago fliers, and some Juniors. 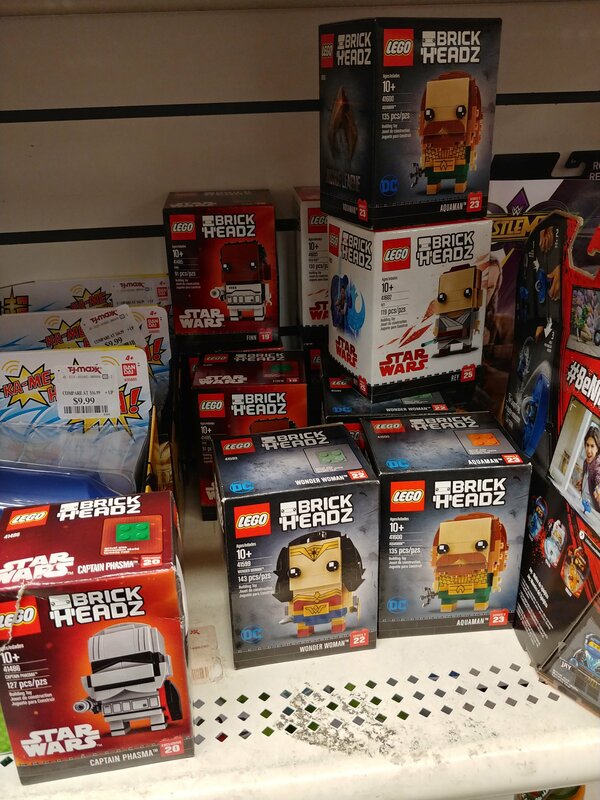 Was the Phasma Brickheadz a TRU exclusive? Maybe I'm remembering that incorrectly. Yup. Phasma, Finn, and the Ninjago Brickheadz were all TRU exclusives. do you remember how much the range trooper was?